Description: Capture the life of the party with authentic wine bottle lighting... The pendant does so much more than deliver light; it adds personality and pizazz to any interior. Perfect for homes, restaurants, hotels, pubs, nightclubs, wineries, and retailers. Two authentic Amber glass wine bottles feature a decorative wrap in an Oil Rubbed Bronze finish. 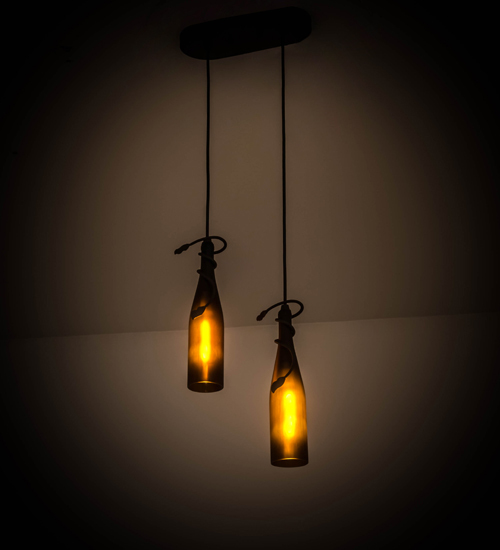 Wine bottle chandeliers, ceiling fans and lamps are also available. Handmade by Meyda artisans in our manufacturing facilities in upstate New York, this pendant is available in custom sizes, styles, colors and dimmable energy efficient lamping options. UL and cUL listed for damp and dry locations.